Black. The color scheme that back dropped God. It had been many years since He remembered the light of heaven. Now, it seemed so far away. Light only existed in a memory. The bliss of gold that used to grace His heavenly feet, was now offset by a cold hard nail, suspending Him between the heaven He missed, and the people He loves. Looking up He was still able, through the veil of clouds, to see His Father. He had grown dim due to the darkness, but He was still visible. His face was still turned away. Why would He not look? He had never looked away before. The internal pain was almost as bad as the external. He never knew that rejection could have this kind of effect upon the human heart. Through dripping blood, He saw the angelic armies watching in anger and disbelief, as countless demons circled His bleeding body, anticipating Eternal Life to finally taste the agony and fear of death. Each angel gripped their sword waiting for the order to spill blood. He had considered it a few times, when the pain was at its worst, but a quick glance into the eyes of the people He was dying for, was enough to not give the order. Pressing downward upon that one inch piece of steel hammered mercilessly into His feet, He rose just high enough to take a short breath of air. He felt as though He was suffocating. Crackling sounds of fluid echoed upon exhale. Each time He took a breath in this way, His exposed intestines were pressed against the crude cross He hung upon, excruciating pain would trigger dreaded convulsions through His battered body, convulsions that caused the devils of hell to explode into mocking laughter. The angels grew restless, they had watched unthinkable tortures happen to the children of men, but to stand by and witness it being applied to their King, was almost too much to bear. Jesus, whispered for them to stand down. Love was at work and it must not be disturbed. 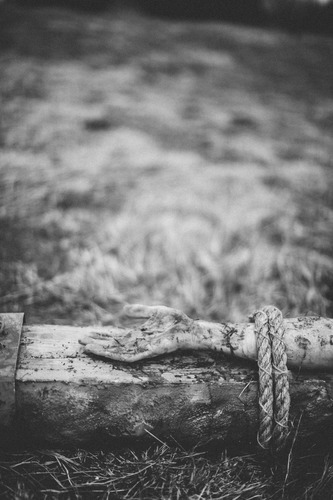 Thirty nine lashes had reduced Him to a piece of meat that was in a great vacillation, reeling back and forth between death and pain, Jesus fought hard to think of the generations before and after Him. Generic humanity did not exist, He saw faces connected with names, names linked with disappointments, and disappointments that would lead to rebellion and hell. He could not let that happen.His heart pounded in His head, blood overflowed with every heartbeat. He looked down, the pool of blood below Him was staggering. It cast a crude reflection of the sky. In this mirror He could see His Father looking, not at Him, but at the blood. This is why He came, to release life into the dying world, He felt the earth respond from its comatose state, as His DNA found its way through the sand and into the earth. This earth was created by the voice God, but it was purified by the blood of God. The planet began to churn and writhe under that cross. His mind had wandered in the pain, He was thinking about those who would read of this account. He knew of no other way to tell them of His love. A sponge laced with pain-killer was pressed against His lips, He returned to reality. He rejected it. The need to identify with His brothers far outweighed the temporary relief that was offered. He must not only suffer, He must redefine how to suffer. Through this suffering, He would also redefine love. The angels were still on guard. The were riveted, and they seethed with revenge. Then the air got strangely cold, a spiritual temperature had arrived that was so thick, that it seemed tangible. Jesus raised His head, through the crowd pushed Lucifer, he was still beautiful, but he also possessed a sickening presence. He stopped. Jesus watched as the Devil found his place amongst the Sanhedrin, who while throwing dirt, also belched out vile accusations and threats against God. Hell hid behind religion and God hung exposed. Satan watched and waited. It seemed that the entire cosmos was waiting on one thing, the death of Jesus. God waited, the angels were waiting, the devils, Satan, and the Pharisees, all seemed to be in a strange unity. Jesus felt His spirit get extremely heavy, one by one, each sin of the world was laid upon Him; over and over, the torture of not only having to bear the sin, but experience it, racked His mind and body. He now knew the feeling of being raped, molested, murdered, abused, rejected, lied to, tortured, oppressed, depressed, hateful, lustful, greedy, selfish, arrogant, hopeless, helpless, fearful, and sad. He went through each one, with those who experienced it. He exited time and suffered each sin with each person from Adam to the last breathing human. He was present for every act of defilement. He bore it with us. He became like man so that we could be like God. How could one sin of disobedience in the Garden result in so much human destruction?He bore each offense. He invited every one of them to come and try to defile Him. The could not. No hook of hell found itself able to penetrate the flesh of Jesus Christ. It was almost complete. He looked to His left, the thief that once ridiculed Him, was now begging to be forgiven. Time separated in that moment. As Jesus looked into the face of this human, this monster of iniquity, He saw every face ever born. His love erupted as if He offered the invitation to all of humanity, “Today you will be with me in paradise.” Peace, for the first time in his life settled over this man. It took the torment of God to bring peace to the heart of man. Jesus felt Himself slipping. Waves of unrelenting pain, coming from every nerve in His body, was effectively convincing His dehydrated, bruised, and exhausted flesh, to give in. His eyes flashed from earth to eternity like a lens between two worlds. Hell lay before Him in one world, and the children of men in another. He saw Gehenna. The place of the dead, the stench, and the tortured souls of humanity reaching desperately out of the darkness for help. With His last ounce of life, He once again lifted His aching body up from the nail in His feet, took one final breath, and screamed, “IT……… IS……… FINISHED!” Demons erupted with shouts of victory, the Devil grinned with a sickening smile and the angels showed the emotion of tears without their substance. Life had been stricken down by death. In a single moment Jesus was awake. Like emerging from a dream, He loosed Himself from the cross, as a spiritual being of power. He stepped down and stared Lucifer in the eyes. Holiness, intimidated rebellion. The angels unsheathed their swords, and once again He issued a command to refrain. Jesus turned, walked to the edge of eternity, and peered into hell itself. Lucifer began to show a degree of nervousness. Jesus looked over His shoulder and again, without a word, stared down Satan, as He stood on the edge of the world. In this moment, it was finally clear to Lucifer what had happened. Jesus was legally authorized to get the keys. With the roar of a horror film, Lucifer thundered, “NOOOOOOOOOOOO!” Jesus smiled from the corner of His mouth and jumped into the abyss. Hell seemed to bear resemblance to the human heart. Jesus walked through the corridors of death and found the keys to this voracious enemy. Hordes of demons flooded towards Him in a desperate attempt to regain the keys. Like a hologram Jesus simply passed through the entire herd. The battle had taken three days. Love paid the price for a people who didn’t know they were being sold. The highest bidder, Jesus of Nazareth, paid for His enemies freedom by crucifixion. Once purchased, He set everyone free. We are free to return to the hell he set us free from, or we are free to torment the hell that once held us bound. We are free to love Him, hate Him, reject Him, blame Him, mock Him, excuse Him, deny Him, or lay our lives down for Him. Either way, It is finished. Either way His banner over you, saint or sinner, is Love. Why I am no longer a Christian…and neither are you.